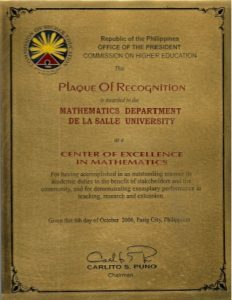 The Mathematics and Statistics Department of De La Salle University is committed to mathematical instruction at the highest level and is consistently recognized by the Commission on Higher Education as a Center of Excellence. It aims to help students learn and appreciate mathematics and statistics as intellectual disciplines and as tools in other areas of endeavor. It strives to develop disciplined but flexible minds capable of logical thought and critical analysis. The Mathematics and Statistics Department was established in 1946 and formally joined with the departments of Biology, Chemistry, and Physics to form the College of Science in 1982. It has 3 undergraduate offerings, namely the Bachelor of Science in Mathematics with specialization in Business Applications, the Bachelor of Science in Mathematics with specialization in Computer Applications, the Bachelor of Science in Statistics major in Actuarial Science. The computing needs of the Mathematics and Statistics Department are handled by the Mathematics and Statistics Computing Laboratory which is managed by the Information Technology Services. It houses around 30 desktop computers which run various software like Mathematica and Statistica. The Mathematics ans Statistics Department, as an academic unit of the College of Science of De La Salle University, subscribes to the University’s vision – mission of producing responsible citizens who adhere to the principles of professional ethics and the Lasallian values of religio, mores et cultura. Guided by the Motto “Christian Achievers for God and Country,” the Mathematics and Statistics Department aims to prepare and train students to become independent and analytical thinkers with a continuing desire to learn and use their knowledge to the attainment of social justice and peace and the preservation of a safe and healthy environment for the benefit of all generations of Filipinos. It further commits itself to the continuing pursuit of mathematical expertise in the fields of instruction and research while constantly enhancing opportunities for social involvement and spiritual growth of its faculty and students. Through periodic assessment, evaluation and updating of its curricular programs and facilities, networking with the national and international mathematical community, and providing technical service to industry and government and private agencies, the Department ensures the attainment of its goals in accordance with the University’s thrust and directions.